A great sign in Building A’s Safavieh showroom at the Las Vegas Market. 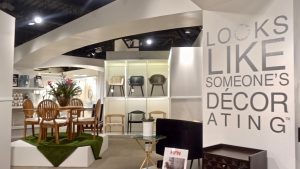 Yes, this is the era of online shopping, but if buyers and interior designers want to see home decor items, furniture and gifts in person, they come to the twice-a-year Las Vegas Market held at the Las Vegas World Market Center. Las Vegas Market is the only show in the west featuring “an exceptional range of product styles, from Modern Classics and Go-To Transitional and Lodge Luxe and West Coast Chic”. 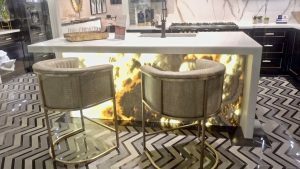 I don’t know about West Coast Chic, but in my August 2 visit to just a few of the showrooms in Building A (Building A has ten stories of showrooms), I saw a lot of furnishings that were not the usual fare. 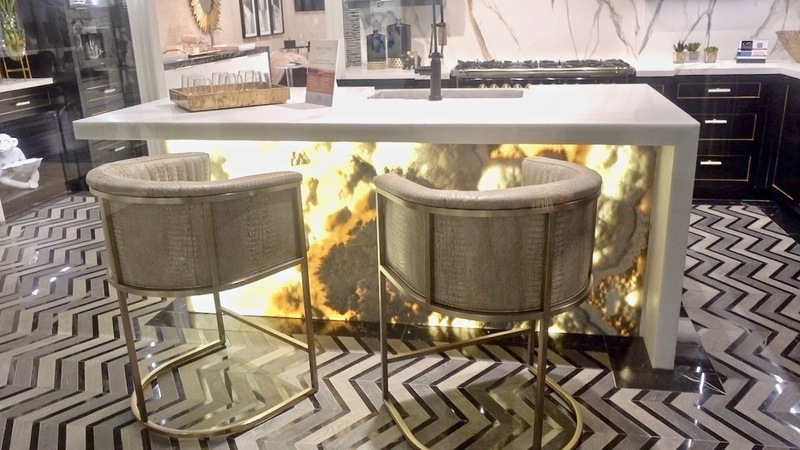 A lighted island highlights this display at the K&B Resource Center at the Las Vegas Market. Attendance at the Las Vegas Market is “about” 50,000 people. Yes, they come for the in-person look at furniture and gift items, but they also come for education. Speakers present seminars with titles such as “How to Improve your Customer Experience with Text Messaging Engagement”, “Captivating Design in Morocco–The New Artisan Frontier”, “Marketing Trends Retailers Need to Know”, and “Thinking Little is the Next Big Thing”. The attached video follows me on my small journey to Building A. Note: In my visit to HStudio and the designs of Shlomi Haziza, I asked about pricing. I was told a cost (per item) would be in the $4500 to $40,000 range and yes, business is good. I have, these days, three dogs, so I can’t be in love with my personal home decor. But I can dream, can’t I? I do so with visits to the Las Vegas Market.